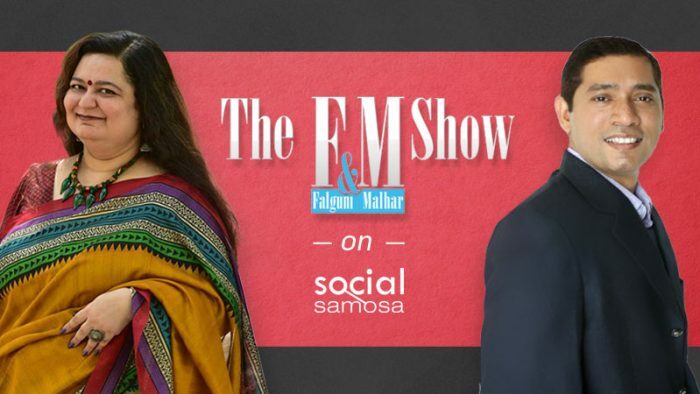 A quick recap of the second episode of F&M Show, find out what you missed with this video featuring Malhar Barai, Falguni Vasavada-Oza and our special guest Neeraj Bassi. Seth Godin once expressed, “Marketing is no longer about the stuff that you make, but the stories you tell.” Everybody loves a ‘Once upon a time…’ and that doesn’t seem to have changed within the digital era where storytelling has still nurtured its spot in engaging the audience with the brands by evoking emotions. Further upholding an intricate discussion around the topic, with their second episode, Associate Professor Dr. Falguni Vasavada-Oza and Group Manager – Tech Mahindra, Malhar Barai take us through the F&M Show detailing the aspects of ‘Storytelling in the Digital World’ with expert guest Neeraj Bassi, Chief Strategy Officer, Cheil India. As Dr. Falguni Vasavada introduced, veteran in the ad industry and having spent over two decades in the industry, Neeraj Bassi became a part of this conversation to share his massive chunk of knowledge of this experience. Speaking about the vast range of campaigns that he’s done, to begin with Neeraj also shared how the CSR campaign for Samsung became one of the top viewed campaigns on YouTube, giving the recent example of his successful involvement with storytelling. Quoting the lines from the book, All Marketers Are Liars, Neeraj expressed, “Great marketers only do story-telling.” He emphasized on the concept of Navrasas, which he states to be one of the core fundamentals of Indian story-telling and how ringing one of these Rasas will aid you connect with people to make transitions in their minds through interesting stories. The conversation eventually evolved to branded storytelling, where brands are inclining towards programs and content to drive stories about their value further giving the example of TVS scooty where a girl gets exposed to her life in a metro, weaving the product (bike) as her companion. He also discussed how the fundamentals of story-telling has not transformed per say and the crux remains in connecting with the hearts of the people despite the medium. But he also added how there are certain elements of the digital world that needs to be kept in mind- firstly, topicality is vital, stay real and the third aspect is complex to implement where the storytelling should be made a part of the consumer rather than brand telling the story. They even conversed about real CSR story-telling and simultaneously how brands are looking into promoting for a cause, which according to him is not as real as the work which is actually conducted on the grounds. The concept of story-telling for brand PR tools was also discussed, along with that they also spoke about how CSR activities are giving plenty of shareable content to brands. The guest even answered as to where storytelling as a strategy is works better, in the traditional or digital medium and also conferred the difference of these mediums. By laying across an array of examples, this discussion was simplified for the viewers. The conversation even flowed to the relevance of storytelling for consumer focused brands as compared to business-to-business brands. Along with that, the evolution of the newer concept, branded story-telling was discussed in dept. Overall, covering all the elements involved with the concept, picking pieces of examples from the real world, Neeraj Bassi triggered an extremely fruitful conversation for amateurs as well as proficient industry individuals to munch from the information laid out.